which will appeal to retreat, school, community, church and conference guests. Conferences and community group events reflecting its mission to provide a peaceful bushland retreat setting in which members of the Catholic community and guests who visit the Centre, can explore and deepen their faith and their commitment to Christ and the mission of his Church, the Centre offers a rare combination of the spiritual and practical: the glorious bushland setting is natural and serene, the accommodation is bright, modern and comfortable, the food is bountiful and fresh, the staff are warm and welcoming, the Chapel is absolutely magnificent. peace and time for reflection. The Cardinal George Pell Hall has seating for 150 conference-style but it can be configured for large or small groups with moveable tables and chairs. 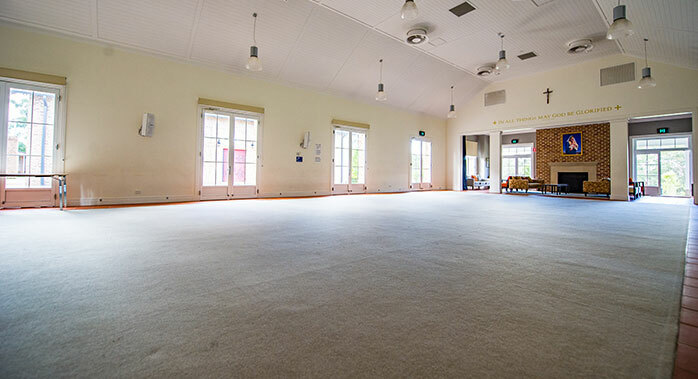 The hall has one large break-out space and four smaller break-out spaces each of which can accommodate smaller groups, depending on configuration. Each room comes equipped with folding mobile rectangular tables which can be set up according to need. The Mary Mackillop Hall has seating for up to 60 conference- style and an area for smaller groups, configurable according to groups’ needs. The staff were excellent and able to cater for our every need. The quality and quantity of food was exceptional. The site facilities were also very conducive to school retreat programs. The entire experience has been tremendous. The facilities have been first class and the staff have been excellent. The food was superb! Overall, it was one of the best retreat experiences we have had.